Cartooning blogs assist greatly in learning about the cartoon world. There are many of them I enjoy dropping in on and reading. It’s a learning experience in many ways and I glean a lot of useful information from them such as learning specific cartooning techniques and how to use certain aspects of Photoshop to enhance your cartoons. They also act as an impetus to recharge my own creativity. Just seeing other kinds of cartoons and cartooning styles reinvigorates my creativity. Cartoonists who blog are also providing useful information to those aspiring artists and others who find cartoons as an art form. I’ve previously written cartooning articles about my own cartoon marketing techniques and how I promote my cartoon services that I hope others find useful and informative. Most of the cartoon related content I write about is short and to the point and I try to discipline myself and keep my articles around three hundred to four hundred words per posting. Any length beyond that and I feel I am over stating information and repeating ideas I may have. I hope to share future articles that display new cartoons I create and favorite ones I have had published in the past. Seeing other previously published cartoons by other cartoonists acts as a form of creative reinvigoration! As regular users of the internet, young cartoonists have it so simple when they can go online and find all of these video tutorials and blogs by artists and illustrators who explain certain drawing techniques. I recall having to visit the library so often to look up manual and special anthologies of favorite cartoonists to study. I was lucky in that so many comic strips were printed in the daily newspapers that provided so much diversity in the comic strips. 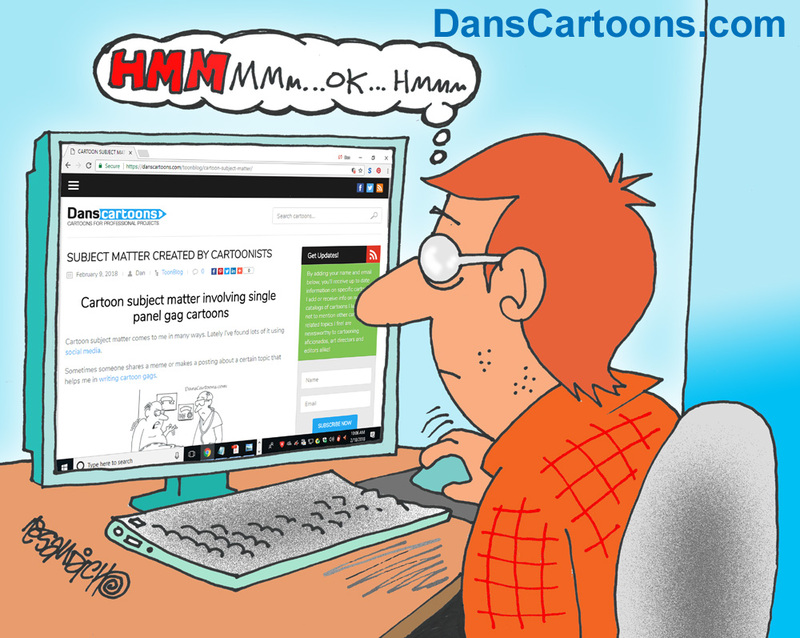 I invite other cartoonists to email me lists of their favorite cartooning and cartoonist blogs and I will compile a list for review in a future post. Cartooning blogs are the best, there is no doubt!